There will be two types of Diamond packages available for the 2019 Congress: Diamond + VIP Networking Reception Host package and Diamond + Regional Room packages. The Diamond Sponsors will be acknowledged as the premium supporters of the Congress, enjoying maximum exposure both before and during the Congress, with the highest priority of branding in all documentation and on-site signage. The Diamond + VIP Networking Reception Host will host the opening Congress networking reception – thus likely taking place in their building. 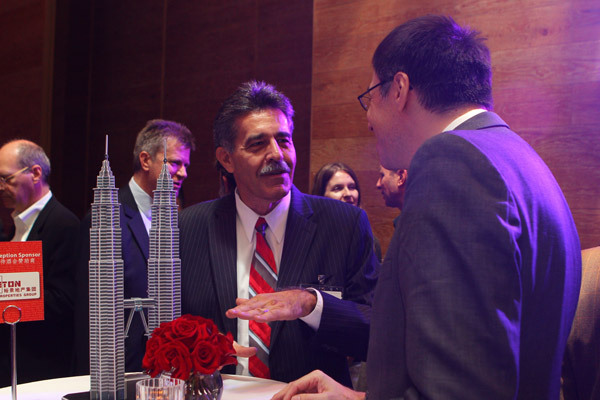 The networking receptions are a major highlight of CTBUH conferences, and hosting will serve as excellent promotion of the building. Past hosts of this important gathering include Emaar Properties (Burj Khalifa, Dubai, 2018), AMP Capital (33 Alfred Street, Sydney, 2017), Ping An Finance Center Construction & Development (Ping An Finance Center, Shenzhen, 2016) and The Durst Organization (One World Trade Center, New York City, 2015). Priority seating for a VIP table of 8 guests at the Congress Dinner. You will be joined by 2 Congress speakers or other important VIP guests at your 10-person table. Logo included in all event collateral including Congress website homepage, ctbuh2019.com, and sponsor section (with web link), brochure, flyers, etc. See all Diamond Sponsor benefits in the table at the bottom of this page. 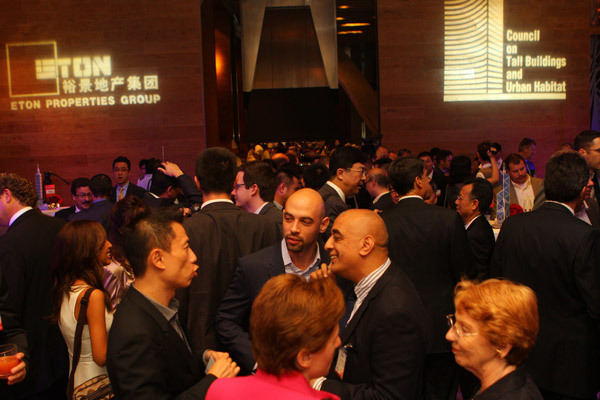 Delegates at the VIP Networking Reception during the CTBUH 2012 World Congress in Shanghai. The Diamond Sponsor will be acknowledged as the premium supporters of the Congress, enjoying maximum exposure both before and during the Congress, with the highest priority of branding in all documentation and on-site signage. Each of the six Regional Rooms at the Congress will accommodate a program track and focus on region-specific developments, most likely: Americas; Asia; Australia; China; Europe and Middle East & Africa. Six Diamond sponsor positions are available for owner-developers to support a room by collaborating with the CTBUH on the program, and utilizing it as an exhibition suite for the sponsor’s projects. *Note: Hosting a conference networking reception involves provision of the space for the reception, together with covering any ancillary building costs for maintenance, security, etc. It is NOT expected for the Host to cover any costs associated with catering for the event (i.e. alcoholic & soft drinks, wine, beer and canapés). In the case of the networking reception, a separate Platinum + VIP Networking Reception sponsor is sought to help cover these additional costs. It is typical that the Platinum + VIP Networking Reception sponsor is connected to the building accommodating the networking reception, through a consultant or supplier involvement in the project. **Note: Each sponsorship package includes an element of exclusive sponsorship of a unique aspect of the Congress, so in some specific events/aspects, not all sponsor logos will be included. +Note: Sponsorship fee is net of all taxes and fees. Any taxes and fees need to be paid by the sponsor. *Sponsorship fee is net of all taxes and fees. Any taxes and fees need to be paid by the sponsor.